Welcome to Screenwriting and Screenwriter’s Utopia! The original (since 1995) screenwriting destination for screenwriters. Please take fifteen seconds to sign up here. If you do, you'll receive Final Draft software discounts and other free offers by simply joining! NOTE: once you join and login this message goes away! Jeff Nathanson is shy. When he comes into an interview, he leans all the way back to put as much distance as possible between himself and the interview. He also prefaces each response with a deep breath. Perhaps the critical lashing he took from Speed 2 made him cautious. Even the successful Rush Hour 2 was no critics’ darling. However, Nathanson has reason to be proud now as Catch Me If You Can lingered at the top of the holiday box office and earned various award nominations. The film stars Leonardo DiCaprio as Frank Abagnale, a real life con artist who traveled the world, forged checks and impersonated pilots, doctors and lawyers. It was a fun journey, but all he really wanted was for his mommy and daddy to get back together. 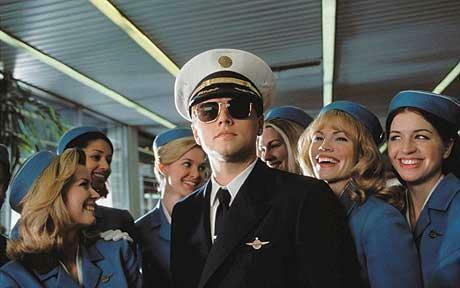 Catch Me if You Can was a novel first, and even Abagnale admits that things were embellished for drama, such as the extent of his French prison stay. The movie does emphasize the character of Carl Hanratty, played by Tom Hanks. In real life, several agents were pursuing Abagnale, but in the film, Hanratty is the one we follow. With a powerhouse like Steven Spielberg directing, it’s hard to know how much of the writer’s vision remained in the film. So, we asked the writer. Why do audiences love con artists? Because I think deep down we all want to get away with things and we’re all bored. This is a way for boredom to manifest itself. At what stage did you get involved with the project? I was sent a tape of Frank talking about his life, as he does occasionally at different seminars and things. About four or five years ago, I took that tape and then I found out there was a book and took it to Dreamworks and said I want to make a movie. They were nice enough to option Frank’s life story and hire me to write a script. I actually read the book pretty much after they had hired me. How did you decide the story should essentially be about Frank’s family? I went to interview Frank. That was the first thing I did. I really didn’t know what to expect or how I was going to write the movie, because it was very episodic and there was a tremendous amount of fun, great cons but there wasn’t necessarily a structural cohesive storyline that you could latch onto and say, “Well, that’s the movie.” My first couple interviews with Frank, I was just like “I don’t know how I’m going to do this. How can you possibly write this as a movie?” It was very late, like in our third or fourth interview, that he finally started talking about his family. And he started talking about his father in detail. It was just one of those moments where I was literally seeing the movie as he was talking because he just loved his dad and clearly was devastated by the breakup of his parents. He had a very difficult childhood and all these things just let me go off and write. Was that a way to make an audience sympathize with a criminal character? Definitely. Not just that they’re divorced but that he is so clearly searching for what he had and trying to get back to that. I’m hoping that’s what they get out of it. Did you always have Leonardo DiCaprio in mind for Frank? Well, the truth is, when I started writing it, was around the Titanic time and there weren’t a lot of young actors around that were like Leo. There just wasn’t. So, I have to be honest, I’m not saying I wrote it for Leo, but we certainly would joke about it all the time. “Where are we going to find an actor to play a guy from 17 to 28? Oh, maybe we’ll get Leonardo DiCaprio.” It was really just a joke until he actually signed on and said he’d do it. Do you see yourself and your youth reflected in Frank? I’m 37. I certainly felt a little bit of the searching for identity part of it as a screenwriter in Hollywood. We’re always searching for an identity. But, it really had more to do with the films I’d grown up watching and loving. Cool Hand Luke and Papillon and Butch Cassidy and the Sundance Kid and a lot of films that really had a tone that I just hadn’t seen on screen in a long time. I’d always wanted to write a film that tried to have that kind of tone. Did your work on action scripts play on how to make a great chase film? No. Okay, why not? I think that the chase sequences you do in action are really specific to those genres. In this film, the chase scenes come out of character and situations. It was actually a new way of thinking for me to try to keep tension and excitement high without the natural moments you’ve seen in The Fugitive or other kinds of chase films where you have big action set pieces. That’s not the movie that this was, so that was a challenge. This film is actually less embellished than the book. Were you conscious of that? Yeah. As I interviewed Frank and I learned that some of the stuff they had done in the book was just for the book, I really wanted to know as much of the truth as I could get and get as much accuracy as I could. Then I started questioning everything that was there. Frank was very open and there’s no way to write the script without Frank’s participation, obviously. What’s something from the book that was total fantasy that you took out? Gosh, I haven’t looked at it in four years. Let me think. What about the prison scene? Yeah, definitely, he almost died in a French prison. The tone of this film was never to be [that serious]. Steven wanted to make a really fun, wonderful, accessible film that hopefully also has a heart to it and all that other stuff. So, we didn’t want to show the bleakness to the degree as it was in the book. Were there any scenes that got lost that you were attached to? I fought for some things. I fought for a few more cons here and there. I remember near the end, there was a little scene that Steven decided to cut and he wasn’t even going to shoot it. I was making my case on the set. I was saying, “Steven, it’s this and this could be great.” He said, “Jeff, you know, I’ve shot 99 percent of this script. Leave me alone.” And I thought, “Yeah, okay. I’ll go away now.” And it’s true, he really did have a tremendous amount of respect for the script and he did shoot 99 percent of it. What notes did you get from Spielberg when you were writing? Steven was very focused on the father-son relationship, the surrogate father relationship with Tom Hanks’ character. Really, the script was very long and he condensed it and brought those two stories into focus. Kind of very early on, he said, “Here’s the movie I’m going to make” and that’s what he did. How did you handle the film’s sense of humor? I think it’s almost an impossible tone to pull off and I don’t think you’ll see a movie with this particular tone in 20 years because it’s very rare for a film to have a sense of humor, to be fun, funny and also deliver on the other stuff. It’s just hard to do. Steven’s a funny guy, has a great sense of humor. I had no idea what he would do with the script, whether he would sort of embrace the comedy that was in the script or remove it and make more of a Spielberg kind of film. I think at the end of the day, he was having so much fun with it and the actors were so great that a lot of it stayed in the movie. Were there any scenes that surprised you to see visualized? There’s the big scene where Hanks comes into France and sees Leo on top of the printing press. Just watching Steven direct that scene and those actors, what they do in that scene. It was just one of those things where you just feel really fortunate to be there. It’s not that you learn a lot because you’re watching people that are kind of operating in another zone, so it’s not like you need to say, “Oh, I see what he did there and now I’m going to copy that and use it in my own life.” It’s really like being a spectator and it’s like watching Michael Jordan play basketball or Barry Bonds hit a baseball. You’re just watching people do something that only they can do. For me, I would just sort of hang out. What impressed you about Spielberg? Steven is involved in every aspect of the movie. He is obsessed with moviemaking. He loves moviemaking. There is no detail, no minutiae that he did not want to know about. So, of course, performance is something that he is right on top of. He is a guy who loves his job and it’s just so much fun to see. People wonder why he’s so successful. It’s because he loves what he does so much, it becomes contagious to be around a guy that’s literally giddy about getting to the set everyday and getting to play with his toys. It’s very fun to look at. Where did the Tom Hanks character come from? It just came from the theme of the film which was trying to show what the world was like back in the 1960s and to show a guy who’s really stuck in the conventions of that time. Tom’s character is completely boxed in and he’s chasing a guy that’s breaking all the rules. So, while it’s based on two real characters, that part of the character was what I invented—the guy who couldn’t even get his slide projector to work, everything around him is broken. Nothing works for him because the world is changing and everything is changing. Technology’s changing, attitudes are changing, the United States is changing, kids are changing, and Vietnam is about to happen, the whole world is about to be completely thrown on its head. Tom is sort of the last guy to know it. What did you learn from the FBI? The truth is, you get a lot of good technical stuff, but at the end of the day, you have to create characters and you have to create scenes. So, all you can do is get accuracy and hope that that helps you create these things, but that’s about as far as it goes. Especially because this is set in the 1960s and there are just certain things that you have to be aware of. Tom Hanks was very aware of his character, creating a character that was completely real to the time, who never said or did a move that wasn’t something that was based on the real thing. How did you capture the innocence of that era? I give a lot of credit to the production designer, who I thought did an amazing job. I thought Janusz [Kamisnki]’s photography is beautiful. And most of all, Steven, who just was able to capture that time. Just because I write little things in the script about what his apartment looks like or what this looks like. It doesn’t mean I know how the heck he’s going to shoot it. He really was able to capture the time in a way that I haven’t seen in a long time. Is Hanratty the villain? No. I think that Frank’s mother is the villain. I think that all kids have this basic trust with their parents growing up, and when that trust is betrayed, then kids usually have to find another outlet and another way to find themselves. As I was writing the script, Columbine was happening, all these horrible things with kids and I really used that because what Frank did was so innocent. Yet, I think the things he did are sort of acted out of the same reasons why kids do the things they do today. I think his mother’s inability in the end to love his father, and probably her inability to love him, is what pushed him. Like all kids, I think he really, truly loved his parents and loved the myth of his parents. He loved the story of “I met your mother and we fell in love” and all that stuff. He loved the idea that it was this kind of fantasy, this romantic fantasy. Then to have that taken away was what sent him running. What have you learned from your experience on the big action movies? I always try to do the best I can, write the best scripts I can for whatever I’m trying to do. Those films are incredibly challenging and logistically a nightmare. The script doesn’t always come first, but I just learned that I can go to war and come out alive on just about anything. What are you working on now? I just did another script for Tom Hanks called Terminal which I think they’re going to shoot in November. Then I’m directing a small comedy for Disney called Providence, which is also a true story and also about the FBI. Based on an FBI sting operation in 1987 where they went out to Providence, Rhode Island. They took an unknown filmmaker from LA with them and they decided they would make a movie. The reason they were making the movie was to hope to get the mob in New England to middle deals for them and the teamsters. They were trying to bust mobsters in Rhode Island and they thought that by making a movie they would accomplish this. It’s a comedy about the FBI making a movie. Do you have any advice for aspiring writers? All I can say is find an idea and write it down on paper and your chances are as good as anyone’s. This was nothing. This didn’t exist in the world. 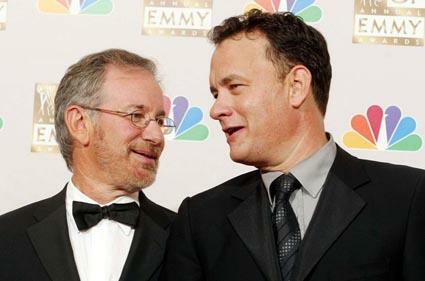 It was just an idea and now it’s a Steven Spielberg movie with Tom Hanks and Leonardo DiCaprio. I guess the possibility is there as long as you write it down and you write a good script. I think you have as good a shot as anybody. Only logged-in members can comment. You can log in or join today for free!